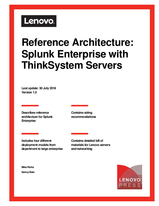 This document describes the reference architecture for Splunk Enterprise using Lenovo® ThinkSystem servers and networking. It provides an overview of the business problem and business value that is addressed by Splunk Enterprise. A description of customer requirements is followed by an architectural overview of the solution and a description of the logical components. The operational model describes the recommended operational architecture of Splunk Enterprise and four different deployment scenarios using Lenovo ThinkSystem servers and network switches. The appendix features detailed Bill of Materials configurations that are used in the solution. The intended audience of this document is IT professionals, technical architects, sales engineers, and consultants to assist in planning, designing, and implementing Splunk Enterprise.